Swimming or a day at the beach is more than jumping into the water and calling it a day. You will need your swimwear, a towel, goggles, and assorted other items. This is why it pays to invest in high quality swim & equipment bags. These items are strong enough to hold all necessary items and may even be waterproof. 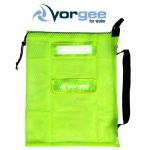 Make life easier by investing in bags meant to carry wet clothing and plastic toys: This ensures you only have to make one trip from the vehicle to the sand or pool. The following are some things to consider when investing in swim & equipment bags. First off, you need to know what size you want. If you only plan to cart around your own items, then you may only need a small or medium sized type of bag. However, if you have family vacations lined up and need to tote around both you and your children's items, you may need something larger. Think about the kind of straps you want on this bag. You can find those that are like a purse or tote bag, or you can find a messenger type of strap that you can sling across your body. Similarly, think about the type or design of the swim & equipment bags: Do you want a backpack-type of accessory, something more purse-like, or something large like a suitcase or overnight bag design? 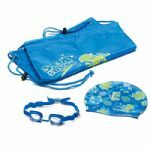 Swim & equipment bags come in a lot of fun patterns and colors: Find one that suits your life! With so many options, you can find bags that look like those you might bring to work or school. Think about whether or not you want a fun print or pattern, or if you want a solid colored bag. There is bound to be a bag that suits your interests, life, and personality!